I am Harrison, I am eleven years old, and chocolate is my favorite ice cream. 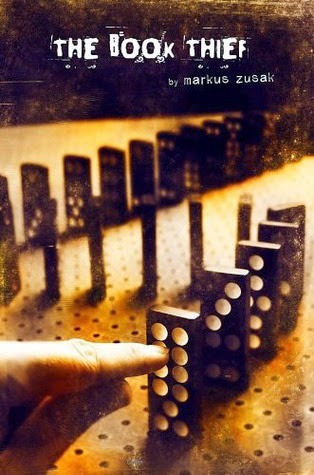 I read The Book Thief, because the setting and the narrator both sounded very interesting. The narrator was Death himself and the story took place during WWII. You can imagine that Death was pretty busy! Memorable. I chose this word because I couldn’t say awesome, because during WWII a lot of people died, and THAT was not awesome. My favorite part was more like an entire section. It was when Max, a Jewish man, hid inside Liesel’s (the main character's) basement. Everything was so interesting and tense, because what if the Nazis found out? Wow. Her problem is a pretty big problem. She’s living in Nazi Germany and she has to keep a Jew safe in her basement without getting caught. And if she gets caught…she’s in a lot of trouble. If I were living in Nazi Germany (scary!) I hope I would be strong like Liesel and try to keep people from dying, like how Liesel kept Max safe. Hey, you know what book you should read? The Book Thief! The narrator is Death, and it takes place during WWII. There are Nazis, Jews, and bombs. Until you have read the Book Thief, you have not read sadness. But even though it is sad, the story is just amazing. I read the book on my Kindle, but I did see the cover on Amazon. At first I didn’t understand why there were dominoes on the cover, but then I realized: the dominoes represent dead bodies falling. It’s a pretty powerful image. There’s nothing really unsaid about Liesel, because at the end of the book, she gets married and lives a long life. I think the story is complete, so I guess the answer is no. No, I can’t. I like historical fiction, but I haven’t read a lot of WWII historical fiction books. And even if I have, nothing probably compares to this book. I do have a couple of books in my reading queue about WWII, like Prisoner B-3087. I'm really looking forward to reading that one. When I was reading the book I actually forgot that the author, Mr. Zusak, was male. I suppose I'm used to male authors writing male protagonists. How did you come to select a female main character and how did you do such an amazing job? The first thing I should say is that I still cheated. I still didn’t write from Liesel’s point of view…but it was actually a natural thing to have a female lead character. The luckiest part about my childhood was to have two parents with amazing stories who both happened to be great storytellers on top of it. With no disrespect to my dad, it was my mum’s world at the outskirts of Munich that had the greatest influence on me. That’s why I chose Liesel. Of course, the instant I fictionalized something, it wasn’t her anymore. Liesel ceased being my mother on page eight or nine and became herself, even when I borrowed from my mother’s life story. Thank you Harrison for sharing Markus Zusak's story with the Kidliterati! I would recommend this book to teenagers and pre-teens that enjoy historical fiction or sad books. You'll love it if you read books that draw you in so deeply that you aren't aware of anything around you. As Liesel wrote, "I have hated the words and I have loved them and I hope I have made them right."